The purpose of this activity is to help students understand the difference between when it is and when it is not appropriate to verbalize specific thoughts/comments. 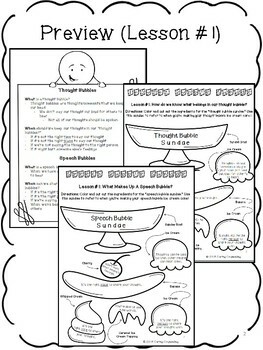 1.Review the differences between what thought/comments are meant to stay in our “thought bubbles” and what thought/comments are able to be “speech bubbles” (refer to the next page). 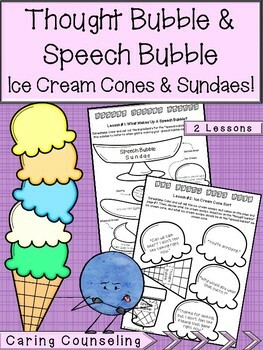 Color and create the thought bubble and speech bubble ice cream sundaes (Lesson #1). Explain that the sundaes can be used to refer back to when sorting ice cream cone scoops (Lesson #2). 2.Color the ice cream cone scoops/cones. 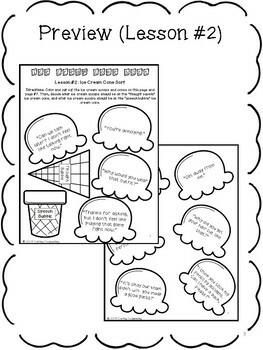 Sort the scoops and create one “thought bubble” ice cream cone and one “speech bubble” ice cream cone.